MaxlifeDirect is the leading industry supplier of Deer Antler Velvet IGF-1 Nutritional Supplements since 2008 featuring our exclusive Antler Velvet Max deer antler spray product line. All of our Formulations are derived from the highest grade New Zealand Deer Antler Velvet Extract. In recent years, the use of Deer Antler Velvet IGF-1 has received much publicized attention due to the positive results it has produced for many athletes in the professional sports world. While Deer Antler Velvet IGF-1 Supplements have gained much attention for their use in the professional sports world over the past 6 years. It is now widely used by people from all walks of life due to the tremendous positive health benefits of Increased IGF-1 Levels. After your mid-twenties, your bodies ability to produce Insulin-like Growth Factor (IGF-1) starts to decline. To pack on muscles you need this vital nutrient to carry body building glucose and amino acids to your tissues. IFG-1 also promotes protein production to boost every cell in your body for top performance, faster recovery from workouts and rapid rehabilitation from injuries. All Products Now Featuring Our Newly Enhanced Absorption System! Antler Velvet Max Extreme 15,000 NG IGF-1 Formula with LongJack! Known to help your body naturally increase testosterone levels and raise libido. 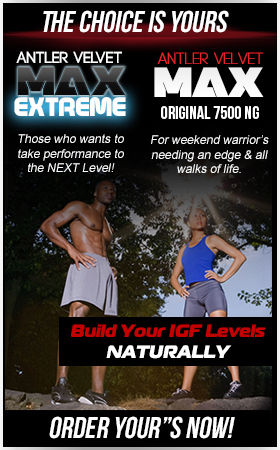 Antler Velvet Max EXTREME IGF-1.New & Improved Formula! Now with TWICE The Strength! Antler Velvet Max Extreme IGF-1 15000 Nanogram formulation was specifically developed for the serious athlete who is seeking to take their performance to the next level. Antler Velvet Max is the ultimate health, muscle and anti-aging factor. ANTLER VELVET MAX Anti-Aging Formula transports glucose and amino acids into the muscle while stimulating muscles resulting in a muscular development in youth & muscle preservation in old age.